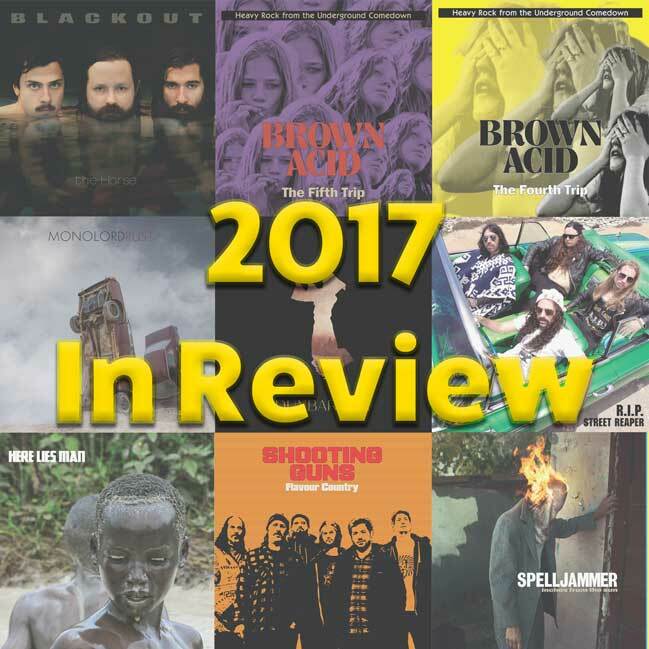 2017 has been a pretty fantastic year for us over here at RidingEasy Records with a wide variety of new releases, merch and events that are only going to get bigger & better as this year turns into the next. So without further ado, let’s get into what made this year so special. We’ll start with the music. We started off the year strong. As the first record we put out in 2017, Here Lies Man‘s first full length has been described as …if Black Sabbath played afrobeat. If that sentence alone doesn’t make you want to check out this album, you might want to get yourself checked. The 4/20 release date for The Fourth Trip was very fortuitous, because this might have been our stoniest Brown Acid compilation yet. From Bad Axe to the return of Australia’s Ash, this record is a journey from start to finish. There are a few words you could use to describe Blackout, but none are more accurate than raw. Brooklyn doom wrapped in a fuzzy psychedelic wrapper, The Horse is doom striped down to its basics: fat guitar tones, methodical drums, and emotion filled vocals. Odds are, everybody you know would like Dunbarrow‘s S/T first record…your dad, your edgy coworker and the classic-rock blueshound janitor at your apartment building. There’s something about this record that’s just universal. It has vibes reminiscent of Zeppelin, the Stones and even St. Vitus. If you like rock n roll or if you like classic doom check this album out. You won’t be disappointed. For those of you who appreciate the psychedelic side of doom/heavy rock will want to listen to all of Shooting Gun’s catalogue, if you haven’t already. Flavour Country is another fantastic step in Shooting Gun‘s already stellar catalogue. Originally released in 2010, Inches from the Sun never got a physical release…until now. Spelljammer‘s first full-length album is not to be glossed over. It’s another solid addition to Spelljammer‘s catalogue which already includes Ancient of Days & Vol. II. I’m not sure how much of an introduction this record needs. If you have heard it, you know what’s good, and if you haven’t…well, there’s just no accounting for some taste. With guest appearances from Trevor Church from Beastmaker and John Gamino from Mondo Drag, this album rips. But did you expect anything else from Monolord? Doom is dead. Well, at least that’s what R.I.P. will tell you. Regardless of the life status of doom, R.I.P. is definitely breathing new life into a stagnating genre. It’s called ‘Street Doom’, and R.I.P. is bringing it with no apologies. Because one Brown Acid compilation wasn’t enough, on Halloween we released the Fifth Trip. This is one of the most rock heavy Brown Acid records yet. Wrapping things up nicely with another release from Here Lies Man, 2017 ends with four new songs from everyone’s favorite fuzzed-out afrobeat band. Including a cover of Fela Kuti’s Sorrow, Tears & Blood, this isn’t a release that should go under your radar. This year we had all sorts of new items in our store – from Sleazy necklaces to satin jackets to Charlie hats. Check out our store and see what you missed.